Conceived during his stint as a stunt extra on the movie Kelly's Heroes, luckily this John Landis film was only made a decade later (after his romps Kentucky Fried Movie, Animal House and Blues Brothers), which in particular enabled the special FX to advance to such a stage (thanks to genius Rick Baker) to become the definitive werewolf transformation movie on which all would be based. The Howling came out around the same time with Rob Bottin's equally impressive, but seemingly lower budgeted take on the wolfman. This unforgettable lycanthrope romp opens with two American backpackers hiking through the moors of England. A crazed animal attacks them, one of them killed, the other wounded. The poor recovering guy is visited by his gory dead friend who tells him that they were attacked by a werewolf and he should kill himself before he turns into one himself and kills innocent people. He doesn't kill himself, and does turn into a werewolf when full moon strikes. On top of this he falls for the nurse looking after him. Landis constructed a great movie with a lot of humour, big scares and fantastic special FX. 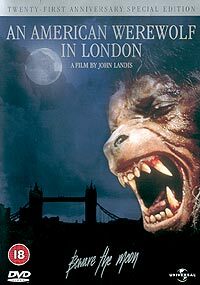 To this day one of the most memorable werewolf flicks. The twin disc 21st Anniversary Special Edition DVD's extra material include a fun actors' commentary track, behind the scenes footage and outtakes, interviews with John Landis and Rick Baker, a look at some prosthetic FX work in progress, a stills gallery, storyboard-to-screen comparisons and production notes in the accompanying booklet.